When considering various painting types, there might be nothing as straightforward as the portrait. Although styles and approaches vary from artist to artist, portraiture is an ancient tradition that portrays the human subject. In the recent past, artists have developed different avant-garde methods to approach this familiar genre, using innovative media with provocative results. Local artist Jeffrey Hale is a portraitist whose work not only uses exciting methods, but challenges the very conception of traditional portraiture itself. Although Hale uses a “sitter” to model for his works, and the portrait is based on the human subject, his work transcends the subject through an intense expressionism, propelled by his inquisitive impulse to look beyond the individual’s surface physicality. It might be said that his portraits are a new genre entirely. An image that appears as though it were impulsively inspired is “Expanding Your Mind.” The female subject—her look tinged with madness, with hair wild and crimson red—seems infused with a psychological presence. She could be from Hale’s present, or perhaps from somewhere in his past. 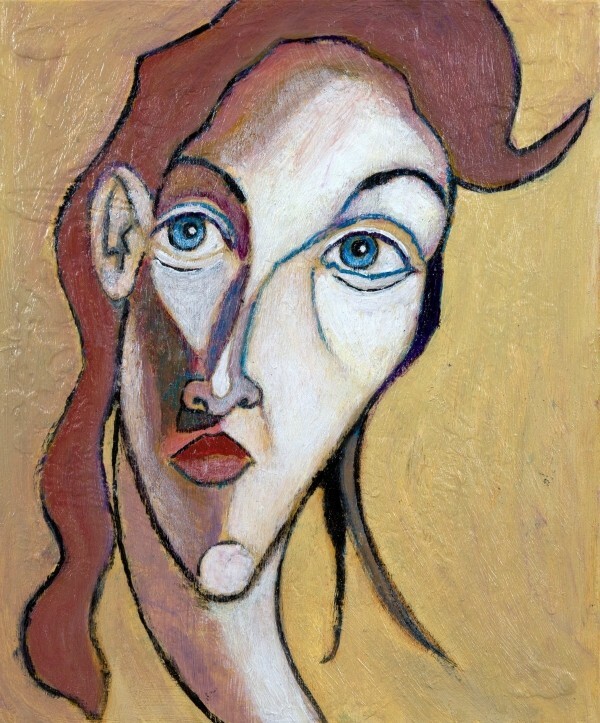 Wherever this intensely rendered creature emanated from in Hale’s existence, one gets a distinctive sense of how she thinks—through penetrative and piercing eyes—and the way she acts, with a jaunting movement of the head on a long neck that is not reserved but bold and aggressive, exaggerated by the head of untamed, fiery hair. When viewing Hale’s work, these “shapes” can have a certain naturalism—and frequently are totally detached from literal human form. Hale defines his work as somewhere between the literal and the abstract. “I do not base on measurements or calculations, I’m not using traditional methods. It’s a bit of both. The reason I am not overthinking is because I am simplifying the figure into shapes. Although it is a literal figure, I am interpreting these shapes,” he says. “Haley (3)” is an unorthodox rendering of the human head, yet what you see is Hale’s interpretation of shape. It is not absurd or strange, but when one “feels” the portrait, there is a stirring emotional flow that moves along with the form. The emotional expressiveness, as visually irregular as it may first appear, dominates any imbalance, and the figure has a rousing eloquence. As the work moves toward abstraction, it seems the subject—although still an individual—has transcended traditional portraiture to become something else: a new subject, a new entity, separate entirely from any literal representation of the original sitter. “I’m not concerned with likeness in the traditional sense,” Hale says. “When I paint, I allow for all sorts of factors; it’s not a controlled environment. “Pierre” is a masterpiece of expression, color and emotion. The painting is thickly layered with loose and animated strokes. The work seems to have been driven by imagination with stunning purples, pinks, blues and deep red. The mood is sober yet glorious, serene yet magnificent. “Pierre” is indeed a creature liberated by Hale’s subconscious, brought to being in a state that seems more lucid than life itself.